Leonardo de Souza Alves*, Bernardo Pace Silva de Assis, Mateus de Almeida Ribas e Nivaldo Hartung Toppa. The emergence of scrotal lump painless in young adult patient is always accompanied by difficult diagnostic. The hypothesis diagnostic of testicular tumors should be evaluated in young patients. The biopsy is not indicated, as this may spread the tumor. Additional tests such as ultrasound, magnetic resonance imaging associated with tumor markers alpha fetoprotein (AFP), beta human chorionic gonadotropic (bHCG), and Lactic Dehydrogenase (LDH) can assist the diagnosis. However, the parasit Schistossoma Mansoni infection can be a differential diagnosis that cannot be forgotten. Patients come from underdeveloped countries, where this disease is endemic, may evolve with the emergence of scrotal lesions that resemble tumors. This is the FP 32-year-old patient, married, no kids, teacher. Was referred by fellow Urologist to undergo radical orchiectomy due to tumor. Patient evolved asymptomatic, only with hardening of the right testicle, without report of trauma. 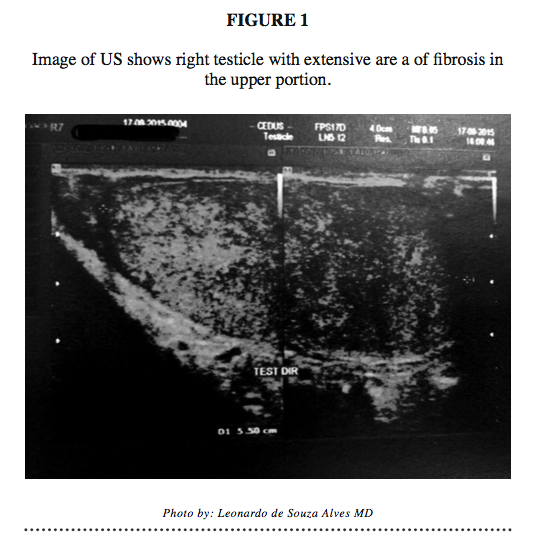 Scrotal ultrasound exam with picture of fibrosis in the upper half of the right testicle, with involvement of the epididymis right together. On MRI diagnosis a hypothesis of solid tumor of right testicle with involvement of epididymis. The blood tumor markers: alfa fetoprotein, latic desidrogenase and beta human gonadotrofic corionic, were normal. By hard difficult tumor diagnostic, and possibility of fertility preservation process. The patient underwent right orchiectomy with access right and the ligature subinguinal spermatic cord with a transfixant silk thread 0. According to the wish of the patient was implanted testicular silicone prosthesis, in the same operative time. The patient was discharged at the end of the day, and return activities in 10 days. The surgical piece presented the testicle with extensive fibrosis in parenchyma, as well as the whole epididymis. The anatomical pathology examination result, described it: “testicle and epididymis showing erasing your usual architecture, with the presence of numerous eosinophilic necrotic-exudative phase, containing viable and non-viable eggs of S. mansoni, under extensive fibrosis”. The clinical diagnosis of Testicular Schistosomiasis is difficult and rare. Typically patients seeking assistance, as the patient in this case, with the suspected testicular cancer. Papers in the literature report the presence of the parasite Schistossoma mansoni in testicles, bladder, prostate and even kidneys(3). Most of these diagnoses are made in the post surgical or post-mortem. (3) The Testicular Schistosomiasis is a rare pathology or sub notified. However schistosomiasis infection is not. It is believed that 25,000,000 people are at risk of contracting the disease. Is prevalent in Central and South Americas, parts of Africa and the Middle East. It is endemic in Venezuela, Brazil and the Caribbean Islands. Is directly related to poor sanitation conditions and quality of life. (1, 2, 3, 7) Usually involves patients who have contact with infested water by the snail Biomphalaria, so is known as “The Snail Disease”. However the ethiology parasite is S. mansoni, who during their reproductive cycle is named miracídio, the form found in the conch who is the intermediate host. The form that infects man is the cercária, the man is, which incidentally, is the definitive host. The contamination occurs by the penetration of the larvae (cercariae) through the leg. After the contamination, these larvae reach the bloodstream and lymph unleashing intense inflammatory process. With the proliferation of mast cells activated by action of IgE. The production of eosinophils increase during this process, which adhere to the parasite to cause the destruction of S. mansoni. The characteristic lesion is the granuloma. (3,7,Figure4) That surrounds the egg with macrophages, multinucleated giant cells, eosinophils, lymphocytes and fibroblasts. (7) This granuloma in reports on the stage of the disease. Exudative, granuloma formed by mononucleated and eosinophils peri egg, inactive phase. The necrotic granuloma with areas of necrosis and fibrosis feature inactive disease. The eggs of S. mansoni are found in the mesenteric plexus, veins that drain blood from the intestines to the liver, where it can cause intense reaction causing fibrosis and hepato splenomegaly, known as portal hypertension. The S mansoni can stay alive in the human body for up to 20 years by eliminating many eggs daily, and debugging the host organism. The diagnosis is clinical and exams. Clinical history, associated with made by the parasitological examination of feces (EPF), are sufficient for most diagnoses. Oligossintomatic disease treatment is simple and easy, with drugs like Praziquantel or Orxaminiquine. On chronic stages of disease, surgical procedures should be necessary. WHY the DIAGNOSTIC is so DIFFICULTY? However, the emergence of scrotal lump, painless in young adult, whit no report of trauma or infection, suggests Testicular Cancer (TC) and not a parasite infection. Testicular cancer a relatively rare, but found in men from 15 to 35 years. It is corresponds to 5% of urological tumors. (8,10,11,12,15) Testicular tumors can be separated into 2 large groups: germinatives and not germinatives cells. Being the germinatives cells the most common and subdivided into: seminomas and non-seminomas. Seminomas tumors are slow-growing tumors and painless. Non-seminomas, tumors already are the most frequent, fast-growing and painless too. The laboratory tests such as AFP, DHL and beta HCG, normally can help in the diagnosis. Are considered risk factors for the development of the disease: criptoquirdia, Klinefelter Syndrome, history of Testicular Cancer in first-degree relatives, presence of contralateral tumour. (8,10,11,12,14,15) In patients sexually active, differential diagnosis with infectious orquiepididimitis, which usually cause pain. Another possibility is diagnostic of inguino scrotal hernias, which can be confirmed by physical examination and complementary ultrasound. In relation to the scrotal tumors, diagnosis is difficult because it is not advised to perform the biopsy, because the chance of tumor dissemination in the path of the needle is great and undertakes to cure the patient. (10,11, 12,14,15) Is characteristic of painless and fast growth of (TC). About of 70% of patients with (TC) already present with metastatic disease at the time of the query. (8,9,1415) The use of methods of image: ultrasound, computed tomography and magnetic resonance imaging; can assist the diagnosis(Photo1,Photo2) But as in the case described, and in others, it’s not enough. In this particular case, the diagnosis, was confirmed only in post-op. Conducting examinations of (EPF) or even rectal biopsy, could demonstrate the presence of eggs of S. mansoni, but would not be enough to rule out the presence of (TC). The first choice treatment is surgical. The surgical technique of radical orchiectomy, discusses whether the spermatic cord (artery, vein, and lymph nodes) with inguinal approach where inguinal cord is clamp before manipulation of the affected testicle, in order to decrease the spread of tumor cells. (8,12,14,15) The retroperitoneal and inguinal lymphadenectomy should be performed. (8) The chemotherapy and radiation therapy may be employed when the presence of testicular tumors but not seminomas(8,9) In the case described, such as the epididymis and the top 2/3 right testicle were affected, it has not been possible to preserve even a parenchyma tumor located, what could be try in selected cases (single testicle, bilateral disease. )(8,15) Placement of silicone testicular prosthesis, doesn’t compromise the healing rate, in addition to improving the self-esteem of the young patient after orquiectomy. According to the information of the examination of the piece, the disease was active in some areas of the testis which can occur until 20 years after the contamination’s mansoni. The intense inflammatory process with the presence of exudate demonstrates the presence of active process. 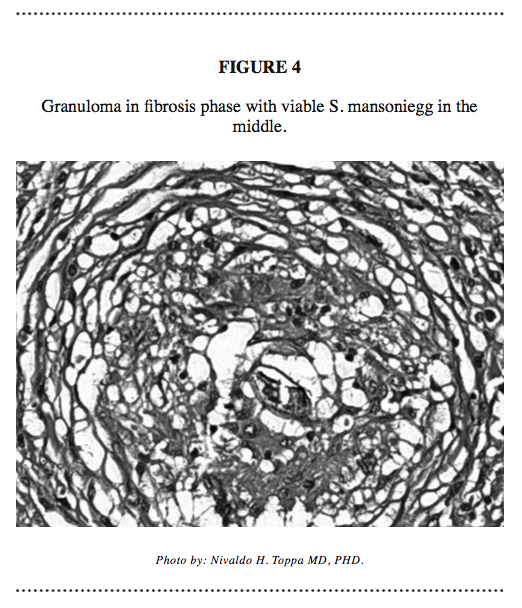 But presence of fibrosis areas with the presence of granulomas, demonstrate a chronic process. This information is important because the disease is active in the body and that the patient was referred to the parasitologist, to receive treatment based on Oxaminiquine, as a single dose. There were no signs of neoplasia in the play. So all the painless scrotal lesions should be considered tumors until the confirmation of the diagnosis, which is often done only in anatomical and pathological examination. A thorough medical history, laboratory tests, imaging methods, can aid in the diagnosis. The preoperative biopsy is not indicated. KatzN, Almeida K. (2003). Esquistossomose, xistosa, barriga d’água. Ciência e Cultura, 55(1), 38-43. De SilvaS, Walsh J, Brown, M. (2006). Symptomatic Schistosoma mansoni infection as an immune restoration phenomenon in a patient receiving antiretroviral therapy. 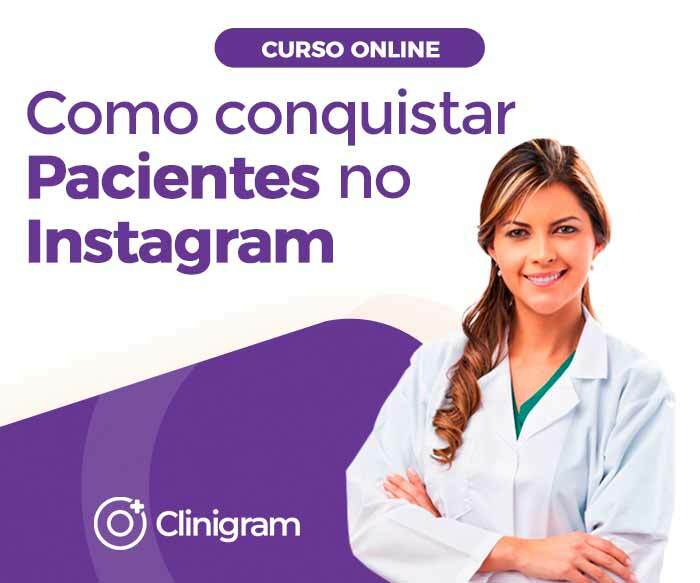 Clin infec dis, 42(2), 303-04. Arban V. (1956). Lesions caused by Schistosoma mansoni in the genitourinary tract of men. Am J Clin Path, 26(9), 1010-21. Keoghane SR, Sullivan M E (2010). Investigating and managing chronic scrotal pain. BMJ, 341, c6716. Rambau, PF, Chandika A., Chalya, P L, Jackson, K. (2011). 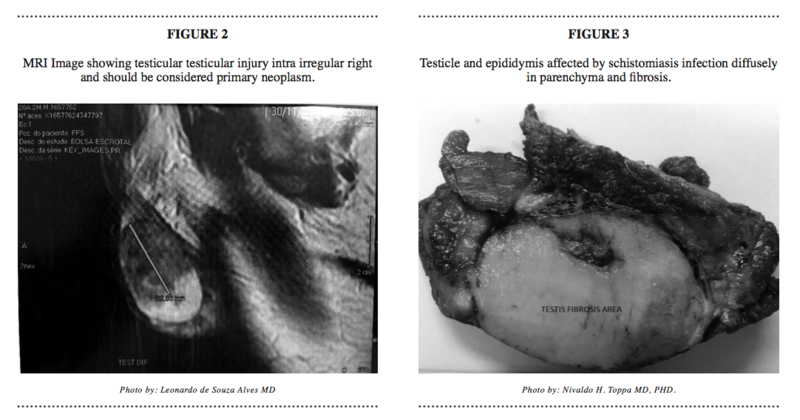 Scrotal swelling and testicular atrophy due to schistosomiasis in a 9-year-old boy: a case report. Case reports in Infec Dis, 2011. Francolugo-Vélez V A, Zarzosa-Alguiar J. (2010). Infección del tracto urinario por Schistosoma haematobioum. Un caso en Cuernavaca, Morelos. México. Rev Mex Urol, 70(3), 187-192. Iglesias JD (1997). Aspectos Médicos das Parasitoses Humanas. 186-210. Júnior, C. V. X., & Hachul, M. (2014). Tumores urológicos no Brasil. RBM rev. bras. med, 71(11). Hassan A, El-Mogy, S., Zalata, K., Mostafa, T. (2011). Testicular schistosomiasis: a case study. Fert Ster, 95(6), 2124-e1. Almeida, LDC, de OliveiraM G, Castro Pereira FM, de Bessa Júnior J. (2013). From incidentaloma to suspicion of malignancy: the diverse clinical presentation of gonadal Schistosomiasis mansoni. Case reports in Infec Dis 2013. Mortati Neto N, Grando, J P, MoreiraH A. (2004). Testicular schistosomiasis mimicking tumour. Internbraz j urol, 30(6), 502-03. Bambirra EA, de Souza Andrade J., Bamberg A, de Souza, EAC, de Andrade Mitidiero, C. E., de Souza A F. (1986). Testicular schistosomiasis mansoni: a differential diagnostic problem with testicular neoplasias. The Am JTropMed Hyg, 35(4), 791-92. Coogan C L, Benson J S, Steinberg R L, (2015). Testicular Mass. In Com Surgil Dis. 309-11). Lopes RI, Lopes, RN, Leite KR, Prando D. (2003). Testicular schistosomiasis simulating malignancy. The Lancet Infec Dis, 3(9), 556.